The road to Lockdown officially began on the Valentine’s Day edition of IMPACT Wrestling as GM Hulk Hogan announced that eight men would vie for a shot at World Champion Jeff Hardy next month…curiously enough they didn’t include Hogan’s own son in-law. Also on the show contestants from British Bootcamp made their TNA debut and a Knockouts Title match was made for next week. Click “read more” for match results and news/notes from the show taken from Chris Shore‘s much more detailed coverage over at ProWrestling.net. Bully Ray made his return to active competition this week, teaming up with Sting to take on Devon and D.O.C. of The Aces and 8’s in a tables match. Also on the show Rob Van Dam defended the X-Division Title against Kenny King and Zema Ion, and Chavo Guerrero Jr. & Hernandez defended the TNA World Tag Team Titles against Austin Aries & Bobby Roode. Click “read more” to see match results/storyline notes from the show. For a more detailed report check out my coverage/review over at 411Mania. 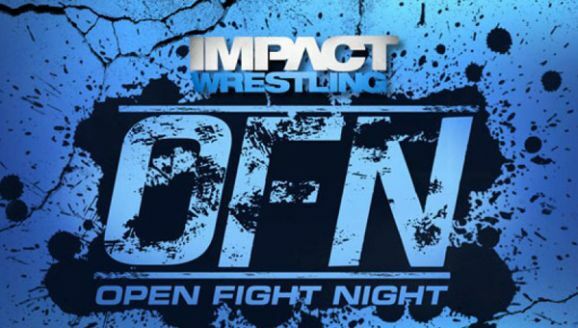 IMPACT Wrestling makes its home in the United Kingdom for the next four weeks and TNA kicked things off with the return of Open Fight Night featuring challenges from Velvet Sky, Joseph Park, a returning (and British) TNA wrestler, and a steel cage main event between Kurt Angle and Mr. Anderson. GM Hulk Hogan also made his return to the show and Bully Ray, Brooke Hogan, & Sting once again pleaded for Ray’s reinstatement. And to top it all off, two new members of The Aces and 8’s were revealed. Click “read more” for results/storyline notes from the show. For a more in-depth look at the show check out my report over at 411Mania. It was all about matrimony this week on IMPACT Wrestling as Bully Ray and Brooke Hogan attempted to tie the knot in the center of the ring. Naturally things didn’t go as planned and a new member of The Aces and 8’s was revealed. In addition a new tag team feud was born and the build to Jeff Hardy Vs. Christopher Daniels next week continued via a tag team match. 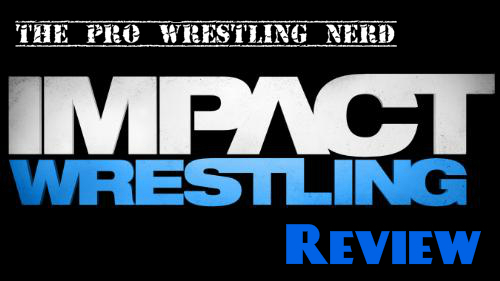 Click “read more” for quick match results and a breakdown review of the show. For a more detailed blow-by-blow account of the show itself, check out my report over at 411Mania. Yesterday TNA held their first PPV of 2013, Genesis, live from the Impact Zone in Orlando, FL. Here are the complete results of the show, taken from TNA’s official website. Chavo Guerrero Jr. & Hernandez (c) defeated Joey Ryan & Matt Morgan to retain the TNA World Tag Team Titles when Guerrero pinned Ryan after a Frog Splash. Mr. Anderson pinned Samoa Joe after a Mic Check; Mike Knox (not named during the show) of the Aces and 8’s came out to distract Joe, giving Anderson the opening. Christian York pinned Kenny King in the finals of the X-Division Tournament; King immediately attacked York after the match which led into York’s X-Division title shot. Rob Van Dam (c) pinned Christian York to retain the TNA X-Division Title after a Five Star Frog Splash. Devon pinned Joseph Park; Park had an Abyss episode making it seem like he was going to win but snapped out before finishing Devon off, allowing the “Sgt. in Arms” to take advantage. Velvet Sky won the Knockouts Gauntlet to become the #1 Contender to the Knockouts Title, last eliminating Gail Kim; the other participants included Mickie James, Miss Tessmacher, and ODB. Kim’s foot was under the rope during Sky’s pin so there could be some issues stemming from that. Christopher Daniels (w/ Frankie Kazarian) pinned James Storm with his feet on the ropes to win a TNA World Title shot; Daniels will face the champion on the January 24th edition of IMPACT Wrestling. Sting pinned The Director of Chaos after the Scorpion Death Drop; The Aces and 8’s tried to attack Sting after, but Bully Ray came out and made the save. He and Brooke Hogan made an appearance before the match to hype up their upcoming wedding this Thursday on IMPACT Wrestling. Jeff Hardy (c) defeated Bobby Roode and Austin Aries in an “Elimination Rules Triple Threat” match to retain the TNA World Heavyweight Title; Aries pinned Roode to eliminate him first, and Hardy pinned Aries a few minutes after to secure the victory. On this week’s episode of IMPACT Wrestling, Brooke Hogan confronts her father about the way he’s been treating Bully Ray, Gut Check gets a very welcome makeover, and Austin Aries and Bobby Roode continue their goal to one-up each other. Click “read more” for quick results and my review of the show. For a more detailed recap on every little thing, check out my live coverage over at 411Mania. TNA presented its first episode of IMPACT Wrestling for 2013 and stacked the deck, with the return of Sting as well as a promising steel cage main event. Unfortunately it all fell apart and resulted in a ghastly two hours of television, of which I have much to say and very little on the positive side. Click “read more” for quick results from the show as well as my breakdown/review.